It all starts here. Just fill out the form to submit your enquiry to find wedding hair and makeup artists in your area. Hear back from available artists in minutes through our internal messaging system, saving you time from searching and contacting each one directly. Our service is free for brides to use so you can choose and book your favourite artist at no extra cost. After clicking 'Send now' we will send you an email confirmation link. Once you confirm we will send your enquiry out to the artists in your area and collate a shortlist of available artists for you. We will send you a summary of available artists as they come in for you to browse and contact for quotes. Here are the bits you may be wondering about. If you have more to ask then don't hesitate to get in touch. How Much Will It Cost To Book An Artist? It is absolutely FREE to sign up and send out your request. Once you have found your perfect bridal artist, all payments for the services required will be arrange directly with the artist at their agreed rate. Artists rates can be viewable on their profile page and will be variable depending on their experience, location and services. Are You An Online Wedding Supplier Directory? Whilst we do offer an Artist Directory for you to browse our growing network of awesome wedding hair and makeup artists, we offer a FREE bridal enquiry service that will keep life simple. 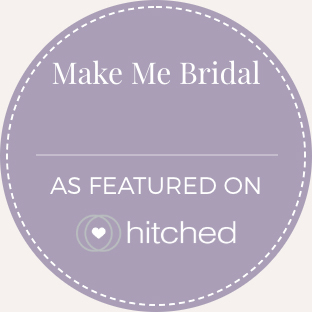 Make Me Bridal is more efficient than an online directory. Connecting the bride with only the profiles of artists who have indicated that they are still available for your wedding date and location. Nope, although like an agency we aim to help you book an artist more efficiently. We understand that planning your wedding requires a great deal of effort and time, yet you may find your evenings and weekends consumed by searching through directories and contacting suppliers who are already unavailable. Let's also consider that freelance hair and makeup artists are busy people too, and letting a bride know that they are already booked can end up on the bottom of their 'to do' list. Make Me Bridal will submit your wedding day details in 3 simple steps, to a large network of artists in your catchment area. Available artists will simply request for you to view their profile and consider them for your wedding day. If they are not available, you just won't hear from them! A little like a booking agency, but without the fees! I've Found An Artist, What Happen's Next? Great! You want to book an artist, you should now invite your chosen artist to view your private profile where they can access your mood board, wedding day details and logged conversations. From this stage the booking is in your hands and you will want to liaise directly with the artist about the trial, deposit, wedding day timings etc. You may also at this stage discuss having a 2nd artist for the wedding day. Larger booking and early starts will usual determine this. Your chosen artist may have a list of other recommended artists to point you in the right direction. How Do The Testimonials Work? After the wedding, the Make Me Bridal team will be in touch to ask you to review your artist and upload at least photo from your special day. Once this is submitted, the artist will get a chance to publish their review. Negative reviews will be logged in our database and repeat circumstances will result in further investigation. We aim to grow our network with brilliant, helpful and friendly artists. Whilst we can not make any guarantee to the bride of the artist's quality of work, we will work to receive feedback as a way of monitoring our network.